One of the famous and most attractive footballers of all time is David Beckham. The former professional footballer played for some of the biggest clubs in the world, including Man United, Real Madrid, and PSG. He is an English model and entrepreneur might have hung his boots for good, but one thing that he still has, even at the age of 40, is his amazing hair style. Here is a look at the changes of the footballers hair, along with the top hairstyles that became hairdos of many people. Throughout the years, Beckham has had different styles of hair that have gone from short hair to medium, to long hair. All along, he has pulled off some of the most amazing hairstyles that have amused many people. He might have had different hair styles over the years, but here is a look at some of his best hairstyles and the ones that became the hairdos of many hair stylists. This hairstyle has some emphasis on the texture and volume as well. He looks spiky with this style, and it was one of his early hairstyles. The hair is also light and makes the head look fuller and thick enough. It would go well with thinning hair. Becks had this hairstyle when he was still a professional football player. He had the style in 2006, while playing for Real Madrid, and had it again while playing for Milan in 2008 and 09. Even though mullet is not many people’s favorite hairstyles, it is among the best hairstyles of Becks. Becks brought a new touch in the Mullet hairdo. It made him look extra sporty and have the naturally young look. The hair at the back is short enough to allow the collar to appear. This was his hair style during his early years at Manchester United. This was around 1995 and 1997. Many people believed that he copied the then top pop group, the Backstreet Boys. However, no matter the perception of his fans, the style became one of the most adored. This one is blended with a tufty fringe. The Caesar is a style of the classic men, and it looks elegant on David Beckham hair. With his secret hair products, Becks looks fantastic with this style. This hairdo was noticed on Backs’ head in 2007 as he was joining the LA Galaxy. This was one of his latest styles and it is his current hairstyle and he has an amazing undercut that is completed with a Fauxhawk. He also matches the style with a full mustache that completes his attractive look. He was seen in the 2014 Wimbledon Championships with this style. This is a casual look that Becks had, and he matched it with a scruffy beard. The hairdo needs little maintenance, and it is easy to handle. He had this style in 2013 when he was playing for PSG. This will need long hair and it is perfect for a sportsman. This style is specifically meant to keep the hair out of the face. The section from the ear line is held back with a band, and the bottom part is left to flow down. Becks pulled off this hairdo in 2003 while playing for Real Madrid. This is the pompadour style that is among the most trending. It goes well with short hair that has sides that are smoothed back. The top part has more volume and Becks knows how to pull it off. This is one of the 2014 hairdos that Becks had after he retired from professional football. Beckham looks amazingly attractive with this haircut, and it is also a top hairdo of the recent times. The chic undercut goes well with a combed-back hair, along with well-groomed facial hair. The moustache is well shaped, and the beards should be well trimmed. In 2014, Becks changed his hairstyle again, and it was listed among the top men haircuts of that year. This is a soft mid-length preppy do that gave Becks the bad boy look. He also dyed his hair brown and was one of his best hairdos. The style has some more volume, and the facial hair is well-groomed too. After a season-long loan with Milan, Becks came back to LA Galaxy with this hairdo in 2009. This hairstyle is nothing, but one of the best hairdos. The finishing of the hairstyle has some cool razor-cut edges, which look angular and sharp. The sides are fringed for a modern look. In 1998, Beckham dyed his hair blonde and he had it in soft spikes that were super amazing. Here, he had not cut his hair the Shaolin-bald style. Though it was short and looked incredible. This one keeps the hair light and thick enough. The wispy fringe style is done with a hairspray or a light pomade. During his return to LA Galaxy, after a loan in AC Milan, Beckham pulled off another amazing hair style that grabbed the attention of the media. It wasn’t much different from other hairstyles, but it was a top hairdo among the best men hairdos. He maintained his hair color, but the sides were levelled, and the top section was raised, with the strands standing towards the forehead. Another hair style of the mid-2000s that entails a simple hair band used to push the hair towards the back. You can choose to push the hair to the midsection of the head, or to the bottom part of your nape. This was another way of keeping his hair simple by using a hair band as a part of his new hairstyle. The hairband was worn on different occasions, but mostly during his active professional football years. He wore the hairband while playing for the LA Galaxy, and also during his loan with Milan. This was in 2007 after he left Real Madrid for LA Galaxy, and later on in 2009, after he had cut his hair in late 2007. Becks pulled off this hairstyle, and he showed the world how you can look amazing for a formal occasion. The style is classic, but quite neat, making him look amazingly handsome. With this look, it is all about grabbing people’s attention. With a comb with fine teeth and a high-quality pomade, you will be sure of having this hairstyle. This was in 2013 after he retired from professional football. This one looks almost like a Mohawk, but the hair is slightly longer, with a pointed fringe. This style makes Becks look young, and the brown color completes the look. The top section is peaked, and it draws more attention towards the eyes. He had this hairstyle in 2009. Becks made another stunning hairstyle that is soft enough and textured. The hairdo goes along with well-groomed facial hair. He still maintains a soft side, with a spiky top part that is dark brown, with some light tones at the hair tip. The top part is raised and directed forward. Even with the facial hair, Becks looks amazing, and he grabs the attention of the media. During his time with PSG, Becks had this amazing hairdo that caught the attention of many people. This is one of the 2006/7 hairstyles that Beckham looked amazing with. The style made him look young and with a fresh-face. The side fringes are well layered, and the stubble is slightly highlighted. Here, Becks has a medium size hair that is also elegant. He makes it looks scruffy with a shaved facial hair, with some low-level beard and mustache. This is when he cut his hair and decided to go for a short, well-groomed hair. He shaved his hair in 2000, and also dyed it black. This made him more handsome, with more attraction directed towards the eye. The facial hair is well-groomed and at a shorter size. It opened Beckham’s face, and it didn’t stop the media from following up his hairstyle. This is the most recent David Beckham Hairstyle that makes him look amazingly handsome. The top section is long enough and flopped to the sides; then the sides are shaved at a lower level. The facial is slightly groomed, but he let his mustache grow to its fullest length. With this style, you can use pomade, which will help to keep your hair heavy and close to the head. He had this style while playing for PSG towards late 2013. With this look, Becks looked like he is from the shower and he just brushed his top part backwards. The back is slick, and the sides are also layered towards the back. The top part has longer hair than the sides, and then it is layered and looks watery. He was spotted with this hairdo in 2011, at the Royal Wedding. This was the look of 1998, which didn’t have much styling. The hair is dyed blonde, with dark roots, and lighter tip. He split the hair in the middle, along the nose bridge and the middle of the eye line. It is parted on each side and allowed to flow down on the shoulders. For a perfect David Beckham hairstyle, he tucks the hair behind the ears on both sides. One of the top David Beckham Hairstyle of the Early 2000s. This is in 2002, after had shaved his hair in 2000. This Mohawk grabs the attention of many, and it has an almost-bald side, with a medium size top part. The hair then styled to form a peaked Mohawk on the head. The long strip runs from the forehead, down to the nape of the head. This was around in 2002, and the hairstyle was spiked on the top part, with a short size, and the sides are shaved off to an almost-bald size. Becks looked amazing with this hairstyle, with his natural hair color. It looks somewhat spiky, but also looks thick. This is another modern hairstyle that entails a trimmed side, with a back-flawed top part. The top part is long and lies towards the back. He has some light tones of the top part of the hair, with a well-groomed facial hair. It is only levelled down, but it is not trimmed. This was one of the hairstyles in 2014. This one is more sporty and it makes Becks look more masculine. He had this hairstyle when he was about to quit his professional football career. The sides are levelled down, and the top part is left in almost-messy spikes. The facial hair is also levelled down, which looks well groomed. This is one of Becks’ best hairdos of 2009. Another of the most recent David Beckham hairstyles that is super-stylish. The hair is combed back and is well-groomed. As usual, the sides are levelled down, but not extremely short. The top part is long and is combed back. He also maintained his natural brown hair. The beards are trimmed, and he looks fantastic with the hairstyle. He was seen with this hairstyle at the start of the year, 2015. These are some of the best David Beckham Hairstyles that he had over the last twenty years. He has trimmed his hair, let it grow and even cut it short enough. 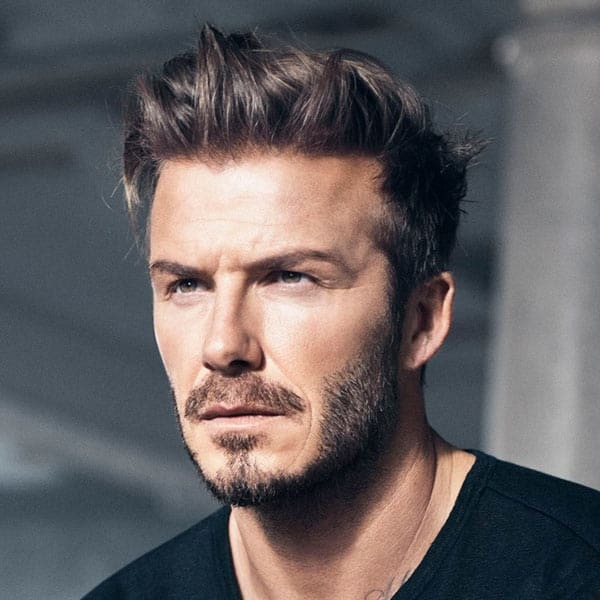 From the Shaolin-style bald hair to the shoulder-length style, Becks has been an attraction of many hair stylists. His hairstyles have been among the best and the most trending men’s hairstyles of all times. It is not clear if his mom, a professional hair stylist is the one behind all the amazing Beckham’s hairstyles. Either way, Becks has a natural hair that will go with any hairstyle. Regardless of the length, he has proven that his hair is natural in styling. If you want to try any of these hairstyles, you might want to seek a professional’s help. Some of them will need you to have the same hair as the David Beckham hair. The color might apply in some styles, but all in all, you can be sure of looking amazing, and stealing the show with any of these styles.